Although just about every Oklahoma casino has a “senior day” promotion (often it’s $10 match play), there is not consensus as to how old a “senior” has to be to qualify. Usually it’s 55, but in some cases, it’s only 50. I thought I’d start to compile a casino-by-casino list, since the casinos cannot be relied upon to publish this information with their promotional advertising. The list is perforce incomplete; I shall return to it as I gain more data points. Feel free to provide any missing casinos and ages in the comments! Holdenville Creek Nation Casino: Senior day is currently Monday. Eligible at age 55 and up. Seminole Trading Post Casino at Wewoka: Senior day is currently Sunday. Eligible at age 50 and up. Seminole Nation Casino at I-40 Exit: Senior day is currently Sunday. Eligible at age 50 and up. Seminole River Mist Casino (near Konowa & Ada): Senior day is currently Sunday. Eligible at age 50 and up. 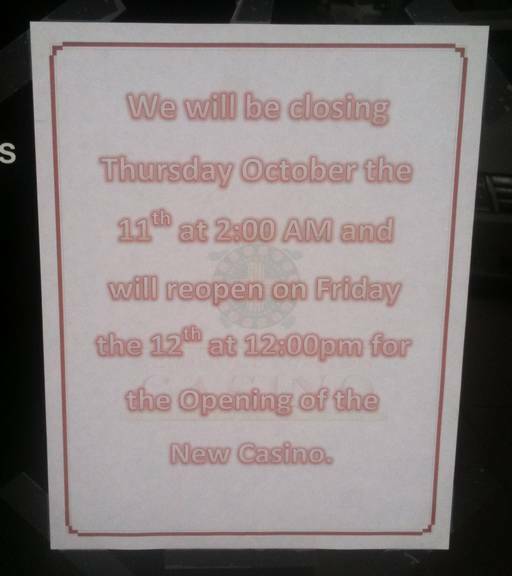 Eagle Bluff Creek Nation Casino at Okemah: Senior day is currently Monday. Eligible at age 55 and up. Sac & Fox Nation Casino at Stroud: apparently no senior promotion. Sac & Fox Nation Casino at Shawnee: apparently no senior promotion. Fire Lake Grand Casino near Shawnee: Senior day is currently Sunday. Eligible at age 55 and up. Fire Lake Casino (“the old Fire Lake”) at Shawnee: Senior day is currently Sunday. Eligible at age 55 and up. Thunderbird Casino at Shawnee: Senior day is currently Wednesday. Eligible at age 55 and up. Thunderbird Casino outside Norman: Senior day is currently Wednesday. Eligible at age 55 and up. Yesterday (Sunday) we stopped in briefly at the Seminole Casino I-40 location to spend a little more time in their new expansion. A day after our Saturday visit, there was one change and a few more things to notice. First, they finally put up a sign alerting people to the need for a new player card. 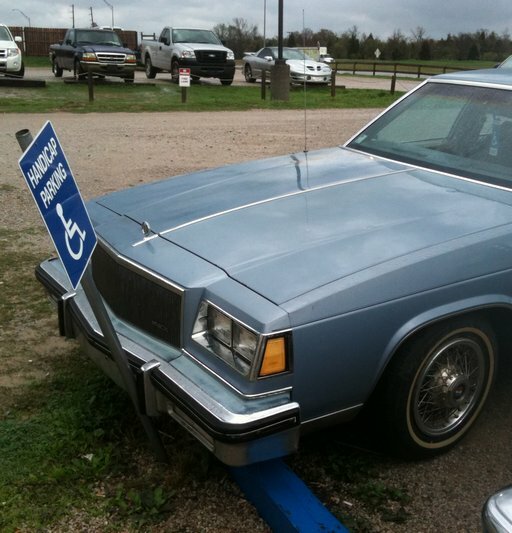 But where do you suppose they put it up? Was it at the door where people could see it upon entering? No it was not! Instead, they put it on a tiny placard stand facing away from the door, to the left of the players club desk, where it was entirely concealed from people coming in by the press of people still in line. Player communications: you’re doing it wrong. Second, the lines at the players club desk were still very long and still very slow. This casino is substantially bigger than prior to the expansion … so why only the same two work stations at the player club counter? Why not lay on a little extra help to make the conversion go more smoothly? Third, the refreshments station did not get upgraded with the rest of the facility; they just moved the old coffee and pop machines over. Somebody didn’t get the coffee maker set up properly; the coffee was musty and weak and undrinkable, tasting like old filters and dishwater. And the popcorn machine? It didn’t make the cut for the move. No more free popcorn available (at least so far). Fourth, they are putting some machines out on the new floor that apparently can’t work with the new players cards; they have placards saying the machines don’t take the cards or award any points. These include both of their banks of Fort Knox progressive machines, and a few others. One hopes this is temporary, but the placards don’t say so. Fifth, we had a difficult time finding a parking place. They’ve put spiffy new paving on the gravel parking lot, but it’s still not much larger than the old parking lot (where they built the expansion) was. 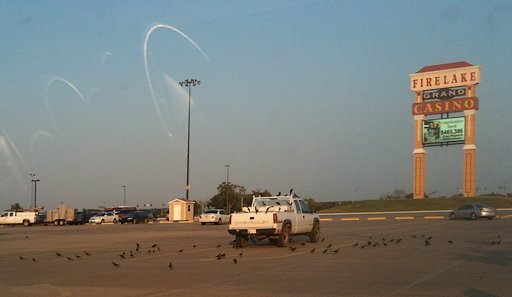 The casino is a LOT bigger … so why not put in ample parking in the huge field adjacent to the parking lot? Although our visit was brief, we did enjoy ourselves. I’m listing problems that people may be interested in, but the space itself continues to impress. It’s a large bright cheerful gambling floor with a great many attractive games. So Pixie and I got into the I-40 Seminole casino today to see the new facility. “The Future Is Here!” says the outside casino signboard — so what does it look like? First impressions were fairly poor. Construction is not complete, and workmen are still sawing and hammering in the area that appears to be intended for food vending, with no barriers or walls of any kind between the construction zone and the casino floor. Much is unfinished (including 2×4 lumber for handrails on the spiffy new entrance portal stairs) and chaos reins. In typical Seminole-casino fashion, the transition appears to have been mostly unplanned, with no thought given to managing transition issues that should have been obvious. For instance: in a very positive change, the casino is moving from the ancient LCD displays by the card reader slots on the machines, to modern video screens with the same slot club interface as that in use at the Fire Lake Casinos and at the Holdenville Creek Nation casino. They are also (like Holdenville) allowing immediate redemption of promotions right at the machine as soon as the little blue stack-of-coins icon lights up — no more long waits in line at the players club desk for your promotional voucher. The bad news? Your “Lucky Player’s Club” card that formerly worked at all three Seminole casinos in Oklahoma no longer works at this facility; everybody had to stand in an (understaffed, terribly slow) line to get a new card. You’ll now need two cards, that will look identical except for different color lettering and a different player number, if you want to gamble at all three casinos. Worse yet, they had NO SIGNAGE WHATSOEVER about this change. We had to learn it the hard way (when our cards would not read in the new machines) and then ask a floor employee before learning that we needed to stand in that huge non-moving line before we could gamble. Eventually they started making announcements, but their PA system is badly designed (or the acoustics are poor) because the announcements were very difficult to hear and understand. On the brighter side, the new casino floor is large and bright with high ceilings and good spacing between the machines. There are many new machines, including a few modern additions like the four different “Collosal Reels” games and a lot of new IGT multigame machines. A few old favorites are gone (my beloved Penny Poker and Press-It-Up Poker machines did not make it onto the new floor) and there is no video poker whatsoever, but there’s plenty of new and interesting machines to play. I was told that the old floor is currently completely closed, but that it will eventually be renovated and reopened. Perhaps some of my older favorites will reappear then, if (I’m not sure about this) they can be retrofitted with the new-style players card screens and interfaces. I also noticed that the non-functional ticket-cashing machine that’s been sitting dark for months in the old casino did not get moved onto the new floor yet and so there’s still no ticket-cashing machine in this casino. We are very pleased to no longer have to stand in line to claim promotional play; that was an antiquated annoyance that needs to vanish from all of Oklahoma’s casinos. We noticed that our points on the old card were converted (without us being told or asked) into promotional play on the new card; we also got $5.00 each as “new players club members” according to the on-screen announcement (again we were not told this at the player’s club desk). There were no new promotions, “Grand Opening” signs, balloons, or free hot dogs; indeed, there seems to have been no effort whatsoever to generate excitement about the new facility or promote it in any way. Just another example of the baffling lack of marketing that is the singular characteristic of casinos in Oklahoma! Of course the notation “12:00 PM” is ambiguous but I am assuming noon on Friday is the time they are trying to convey. Scuttlebutt around the casino is that there won’t be any sort of grand opening or promotions connected with the new facility. I heard “there might be something new next month, but nothing right now” several times. If you’ve been by lately, you’ll have seen the huge new tent-like temporary structure they built for the expansion. It’s looking very nice with a huge portico and brightly colored lights playing on the highway end. However I was disappointed to notice today that more than half the old machines (the better half, for the most part) from the old casino have been removed in the last few days, and so I am presuming they have been installed in the new site. So much for my dreams of bank after bank of new machines! Meanwhile, the existing facility is starting to feel like a store that’s 3/4ths of the way through its post-bankruptcy sale, with empty holes where banks of machines used to be and random stacks of unused casino chairs everywhere. I also noticed that the unused ticket-changing machine (that’s been sitting there, dark, for the last three months, while people stand in line at the cashiers’ cage) is still sitting, dark, in the old casino space. I’d been hoping that they’d move it into the new facility and finally start using it! But, apparently, no such luck. Short version: all of the match play at the Sac & Fox Shawnee casino is going away as of Sunday October 14th. 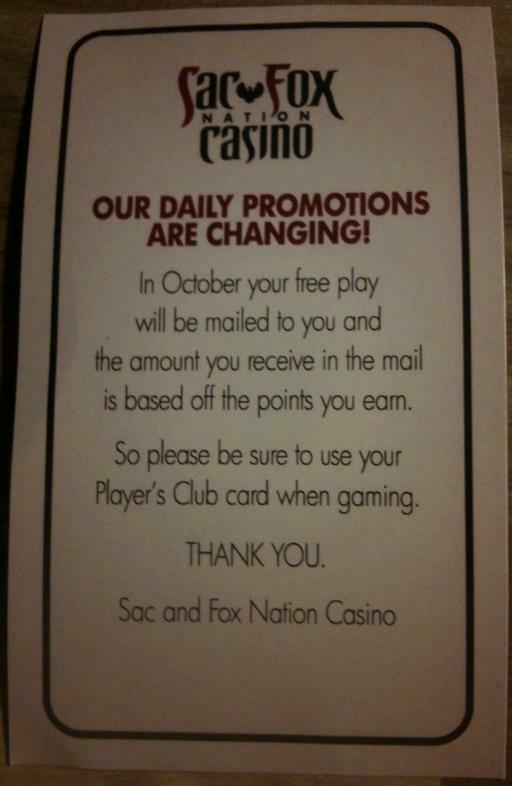 October 22 update: As of today’s date, neither Pixie nor I have received any mailed promotion from the Sac & Fox casinos. We’ve gambled there 2-4 times a week for the past four or five months, and yes, we did confirm our mailing addresses. So it would appear that “In October your free play will be mailed to you” was a simple lie, intended to make the promotions cancellation appear less dramatic than it was. Of course it’s very possible they are sending promotions to select heavy players, but for average gamblers not putting whole paychecks on the line, there don’t appear to be any mailed promotions whatsoever. If you’ve seen any mailers from them, please comment! We’d love to know what promotions you are getting, along with an idea about how much you’ve typically gambled there. If you’ve been gambling regularly in Oklahoma casinos in the last six months or so, you’ll have noticed that match play promotions have been being radically pared back. A typical pattern six months ago was one or more $10 match play opportunities during the week and one or two weekend offers of $20 or $25. These have been vanishing everywhere, replaced with lame drawings, $5 match promotions, and what we not-so-lovingly call “half-assed match play” where you play $20 to get $10. Casinos we’d routinely take long drives to visit (Okema/Creek Nation/Eagle Bluff, are you listening?) went from generous promotions ($25 match two nights a week, $10 some other night, $10 each on mens/ladies day) to near nothing ($5 each on mens/ladies day, now reduced to a tiny four-hour window in the evening). And consequently, now we just wave at the sign as we drive by on the highway. We love to gamble, but most of these little casinos aren’t all that entertaining if the house won’t give back a little bit of advantage to get us in the door and give us a fighting chance to pay for our gasoline. Just the other day I had observed to Pixie on one of our long drives that the last bastion of generous match play was the pair of Sac & Fox casinos in Shawnee and Stroud. For as long as we’ve been playing, they’ve offered genuine match play every day of the week, in amounts ranging from $10 to $20. On $20 days it’s enough to get us out on the highway and heading that way, and on $10 days it’s at least a guarantee that we’ll stop by if we’re passing through or near Shawnee. Stroud? Well, the Sac & Fox Stroud is a long way from anywhere we go, but on $20 match play days we’ll still head that way. No promotion? Not going there! Or not unless we’re going by on the turnpike, as happens maybe once in sixty days or so. We were having that conversation while trying to puzzle out two things. First of all, around the beginning of the month we noticed that the Sac & Fox in Shawnee didn’t update its promotional posters; up through yesterday they were still flying the September posters in the huge marquee bulletin board by the main entrance. Why were they still talking about the September piggie bank promo instead of whatever October’s promos are supposed to be? 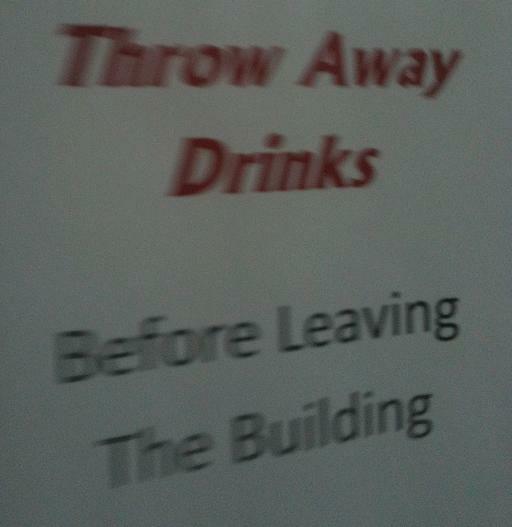 Second, and possibly unrelated: late last month the Sac & Fox Shawnee suddenly got stingy with the free beverages. Typically at these casinos, if you are still drinking your tiny cup of free coffee when you walk out the door, nobody seems to care. A few of the bigger casinos that serve drinks exercise “cup control” at the doors, but that’s understandable if they wish to prevent people walking out with open containers of booze. Otherwise, you walk out with your coffee and drive away drinking it. Until recently, that was the deal at the Sac & Fox, and why not? Nobody is going to burn a buck in gasoline to come and steal five ounces of bad machine coffee that costs maybe six or seven cents to serve. And sure enough, they were bloody serious about it! Not only did signs go up on the doors, but they rejiggered their security kiosk from just inside the doors (and only sporadically manned) to a position between the double doors (and permanently manned with two beverage-control security officers). Two weeks later, the full-time security on the door is still there, and people are still throwing coffee in the garbage as they leave. I’m sure that’s saving the casino so much money! I find the use of the phrase “free play” on the little hand-out card somewhat telling in this context. Excepting on my birthday, I’ve never received a dime of free play at the Sac & Fox; match play is not the same thing at all. But if they have a new manager who is offended by the monstrous revenue bleed that is people leaving with half-cups of the free beverages, maybe he/she is also horrified by “all the free money we are giving away” or some such foolishness. In any case, it’s bad news for players. In my experience, Oklahoma casinos are not good at maintaining mailing addresses; they are constantly swiping your ID and will often replace your mailing address on file with the physical address on your ID. However, if you ask them to update the mailing address manually, they’ll smile and say it’s done, but it doesn’t reliably “take” in the database, or it gets wiped out the next time they swipe your card. What’s worse, even when they are successfully sending mailers, they aren’t consistent about promotions. I can’t tell you how many times Pixie and I will go to the same casinos on the same schedule, gambling similar amounts of money, only for one of us to receive a promotional mailer while the other gets nothing. It happens more often than it doesn’t happen, that’s for sure! So, I don’t expect that the Sac & Fox will routinely send out coupon mailers. Obviously time will tell what the coupons consist of, but we aren’t big-money gamblers; we typically gamble no more than about two to five dollars for every promotional dollar during any given visit. It’s hard to imagine any “based off the points you earn” coupon regime that could deliver coupons to match the $95 in weekly match play that the Sac & Fox has been offering. Holdenville Creek Nation Casino is a small, friendly, locals-oriented casino with slot payouts that “feel” reasonably loose. Although their promotions are declining in recent months (match play opportunities keep getting fewer/smaller, and they no longer offer free play on their Sunday “customer appreciation day” as of October 2012) Pixie and I try to visit whenever they offer match play. Security is very good, the parking lot is heavily monitored, the “tweaker factor” is fairly low, and all-in-all, it’s just a pleasant place to gamble. We especially appreciate that they seem to add new machines fairly often. Once or twice we’ve even seen a new machine here before we saw it at any other Oklahoma casino. November 2012 update: Unfortunately, the Holdenville Creek Nation Casino has earned an entry on the wall of shame for failing to honor one of its advertised promotions. As I write this, the Okie Gambler website is a bare WordPress installation with a generic template. It’s like an apartment with no carpet or furniture. It will get better — slowly — over time. But meanwhile, I need a place to share what I know about gambling in Oklahoma and to hear from other Oklahoma gamblers about what they know. And to shoot the bull about it. Why do Oklahomans need a gambling website? Well, I think we do. We’ve got a great many Indian casinos, and (for better or worse) they’re becoming an important part of the cultural and social and economic lives of a lot of Oklahomans. And yet for some reason, getting good information about Oklahoma gambling on the internet is quite difficult. Casino web sites are frequently poor quality, and third-party sites about the gambling scene in this state are not numerous or up-to-date. There’s also the issue of accountability. If a casino behaves badly — and sometimes they do — what is to be done? Casinos are theoretically in competition with each other, but if there’s no place for happy and unhappy customers to share stories, how is that competition to operate? I was surprised to discover that none of the casino-listing sites had much in the way of comments or user reviews. If The Okie Gambler can fill that void, I’d be quite satisfied. What do I hope to see on The Okie Gambler? My goal (and this will take a long time if it ever happens) is to build out the site until it contains basic information about all the casinos in the State of Oklahoma. The ones I gamble at will also have more detailed reviews, updated as things change. Plus, I expect (using links and blog posts) to consolidate for my own convenience the best web resources about Oklahoma gambling and the Indian casinos in this state. I also have opinions — strong ones — about my gambling experiences in Oklahoma; you’ll get to read those. And finally, I hope that others will find the site useful enough that they start sharing their local gambling experiences here as well. Who Am I To Write About Gambling In Oklahoma? I’m just a dude. I’m an Okie only by courtesy (haven’t been here long enough yet) but I live in the middle of the state in one of the zillions of little towns. I’m self-employed (self-underemployed?) and I share my life with Pixie (not her real name), who is a tribal member and family care-giver. We like to go out gambling. Because there isn’t much extra money in our budget, we haunt promotions. We drive a lot, we gamble a little, we hoard our winnings and we cut our losses before they get too deep. Ultimately, we win more than we lose, but we tend to pay it back out on the back end for gasoline and vehicle wear-and-tear. Gambling, for us, ends up being cheap entertainment and “free” meals out (paid for by gambling winnings). It’s escapism — the best and cheapest we can find, living where we do and subject to the obligations we are laboring under. Me? I play video poker when I can find it, slots otherwise. Pixie plays the penny slots, a lot harder than I do. Neither one of us are much for table games, or Keno, or bingo.